Some of the most exciting creative movements are forged in the face of great adversity. All around the world, a new generation of talented designers, musicians, and artists are coming together to fight against social repression, political turmoil, and violence with strength, creativity, and passion, as they seek to change not just the world around them, but the world at large. Across Eastern Europe and stretching out into Russia, this wave of creativity is perhaps at its strongest. Rising from the ashes of the Eastern Bloc and propelled forwards by the likes of Gosha Rubchinskiy and Demna Gvasalia, designers including Anton Belinskiy, Situationist, Akà Prodiàshvili, and Berhasm are asserting themselves as ones to watch in Ukraine, Georgia, and Russia respectively, as part of the final generation to be born under Soviet rule. Joining this growing, transgressive list of labels is Kiev's Podmost: a boundary-pushing brand inspired by skaters, rappers, punks, tattooists, and artists, which was formed in collaboration with Moscow-based creative community TRK Russki Attrakcion. The brainchild of Ian Block, who started out hand-printing graphic tees in a garage in his hometown (“I used to clip the t-shirt on the school table with a door hinge when I was 13 or 14 and just get to work”), he describes it as ‘a brotherhood’, and the group of creatives he surrounds himself with as something akin to the Lost Boys – an idea the brand’s latest collection, INTERNAT, plays on. “In Ukraine, an internat is a house for children without parents,” explains Block. “None of the members of Podmost have good relationships with their dads, it’s something we all share. Fatherlessness, and the feeling of no past.” With many of their fathers absent, the boys set out to create their own family – Podmost, which takes its name from the neighbourhood most of them live in, was the result. INTERNAT may have its roots in adolescent difficulties and absent fathers, but the collection itself offers up a uniquely dark, humourous take on the issues at hand – in addressing the situation, which affects countless kids across the country's capital, Block proves there is strength in solidarity. Featuring a series of oversized hoodies, t-shirts, and the now-ubiquitous dad-cap, garments are woven through with Soviet inflections and heavy metal iconography, and bear the tongue-in-cheek and to-the-bone graphic motifs the label is becoming notorious for. Music also plays a big part in Podmost. Block himself is the frontman of Metel – a post-punk band with a totally in-your-face attitude – while many of his friends are musicians too. 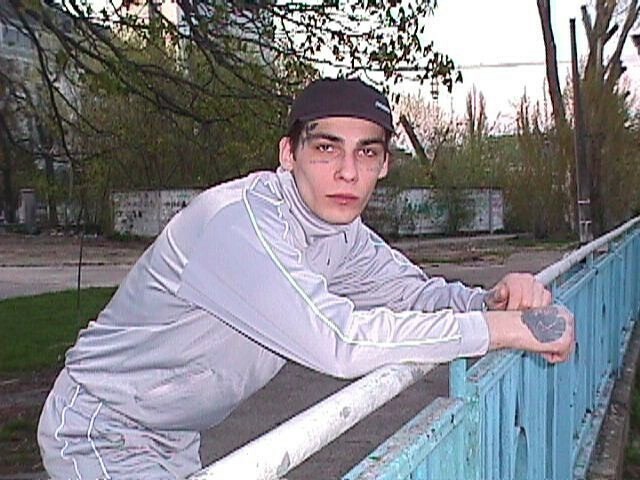 It’s within rap that the brand has had the biggest impact so far, though, with Podmost proving a hit amongst Russia’s rising underground stars. More internationally, Rejjie Snow was spotted wearing one of its printed t-shirts earlier this year. “The rap is for partying, punk is for our demons. Hip hop is the brother of metal. We respect it all,” says Block. It’s through word of mouth that the brand’s message has really been spread, though, as kids from the Ukraine pass the knowledge of the fledgling label amongst each other and out into the wider world beyond. Block explains that many of the upcoming generation seem lost, but through Podmost he's doing what he can.